San Francisco's Blue and Gold Fleet operates seven days a week serving Sausalito from Fisherman's Wharf, Pier 41. The Golden Gate Ferry Service also serves Sausalito daily from the downtown San Francisco Ferry Building. From the South: Sausalito is directly across the Golden Gate Bridge, north of San Francisco off of Highway 101. Take the Alexander Avenue Exit and follow the road into town (Bridgeway). 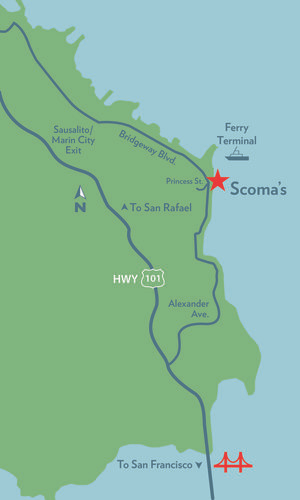 Scoma's will be on your right. From the North: Take the Marin City/Sausalito Exit off 101 South. At the stop light, turn left going under the freeway. Take the first right onto Bridgeway. Follow Bridgeway for about two and a half miles. Scomas will be on your left. © SCOMA'S SAUSALITO 2014. ALL RIGHTS RESERVED.